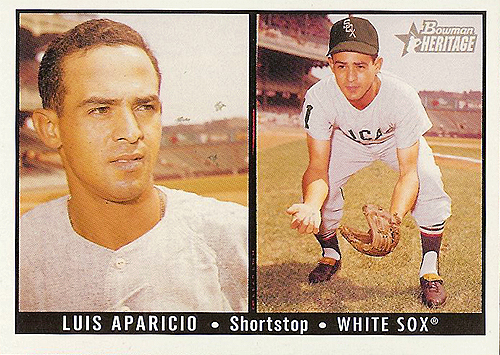 Just learned of the existence of the Luis Aparicio award, given to the best Venezuelan player in the majors as voted on by the Venezuelan sports writers. Carlos Gonzalez of the Rockies won it this year. 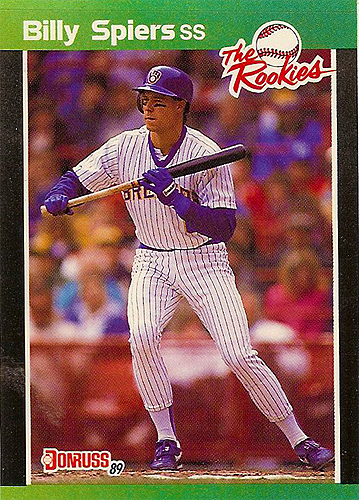 Now we get into a player that I contemplated collecting back in 1989. Bill Spiers wasn’t exactly a giant hit in our neighborhood, but I liked him, and I thought he had a solid future in the majors. 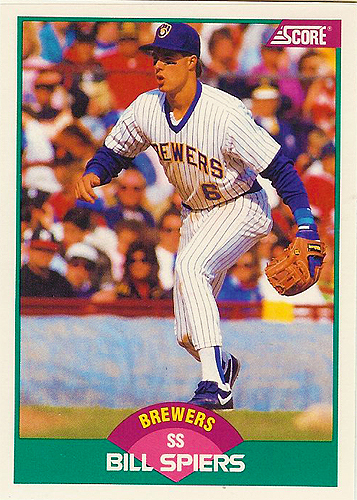 I briefly flirted with the idea of collecting his cards, but decided to pass after all, as I had no real connection the Brewers outside of liking Paul Molitor and Robin Yount. 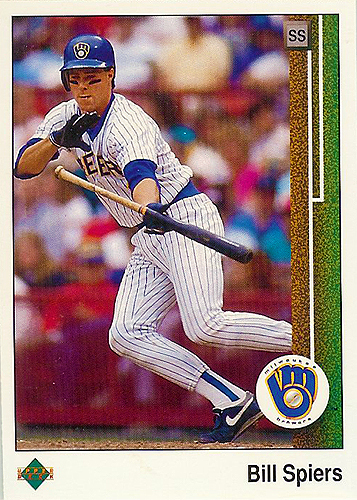 Bill was the Brewers’ 1987 first-round pick from Clemson University. 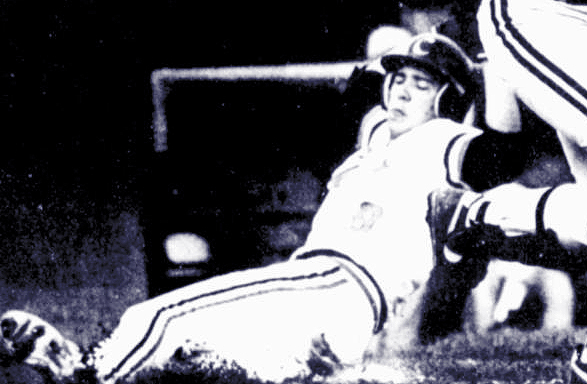 He had hit 17 home runs as a shortstop there, hitting .325 with a reputation for slick fielding, as well as serving as the team’s punter, averaging 39.2 yards a punt. He was expected to anchor the kicking team for Clemson in 1987, but when he accepted the Brewers’ offer, the football team had to scramble for a solution. 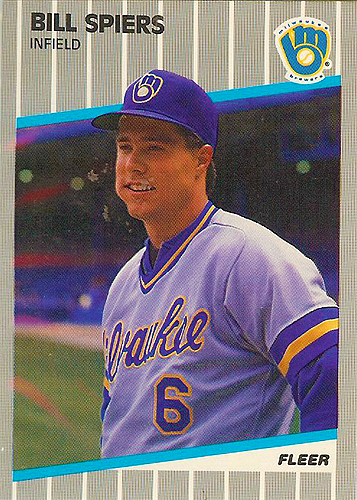 Bill started with rookie league Helena in 1987, hitting .409/.480/.455 in 6 games there before getting moved up to A-level Beloit, where he hit .298/.344/.380 in 64 games. It was a damned good start for a shortstop, especially one with a good defensive reputation. He was already getting a bit of a reputation as a fiery player, though. In 1988, he got some time with the team in Spring Training before being sent down to high-A Stockton, where he hit .269/.353/.377 in 84 games. The Brewers advanced him again, this time to AA El Paso, where he spent the rest of the season hitting .280/.344/.387. 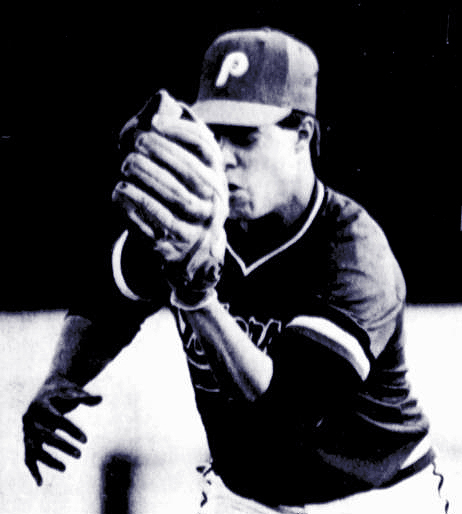 Spiers was invited back for Spring Training in 1989 and made the team in a surprising decision, splitting time with Gary Sheffield before Sheffield was moved over to third despite his protests. Spiers’ first game was April 7th, at home against the Tigers, where he had no hits; his first major league hit would have to wait until April 10th, when he started against the Rangers in Arlington. He wouldn’t get a hit again until April 17th. He came into the game hitting .063/.158/.063, but went 2 for 2 that day with his first homer, a grand slam off of Brad Arnsberg to put the game out of reach in the top of the 9th. Unfortunately, he would only get one more hit in April, going .154/.258/.269 for the month. May would be a little kinder, though. He only played in one game between April 30th and May 6th, getting no hit, but he broke out again on the 6th, going 2-for-3 with a run, bringing his line up to .194/.297/.290. Between then and the end of the month, he would go .288/.373/.346 with 3 doubles and 4 stolen bases. June was a disaster, though. He hit just .200/.259/.200 before he was sent down to AAA Denver, where he would hit .362/.423/.574 with 2 homers in 14 games before being called back up. He made his return to the majors as a defensive replacement on July 16th, then a late-inning replacement again on the 17th, getting a hit there and earning a start on July 18th. He went 1-for-4 in that game, and began to steadily hit, his numbers increasing throughout the month. He hit .341/.333/.341 with two homers in July, boosting his numbers to .262/.317/.302. This was about the time I started to notice him, as I recall. He got steady play throughout August, but failed to match his torrid pace from July, hitting .180/.232/.213, falling to .231/.286/.269. But the Brewers stuck with him, and he improved his game in September, hitting .308/.327/.477 for the month, ending at .255/.298/.333. 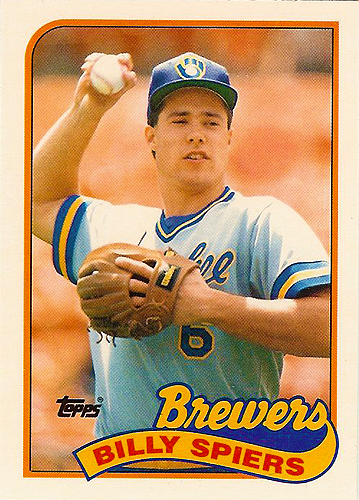 Obviously, the OBP was a concern, but overall the Brewers were happy with his glove, especially. At this point I would have declared his career at a crossroads; plenty of players had arrived at this point and never gone anywhere in the past, but he was only 23 and had time to improve. He hit worse in 1990 and returned to AAA again for a bit, then rebounded in 1991, finally showing the offensive promise he had shown in the minors. Then he got injured in 92, missing almost all of the season and moving off of SS permanently, as his range was much reduced. 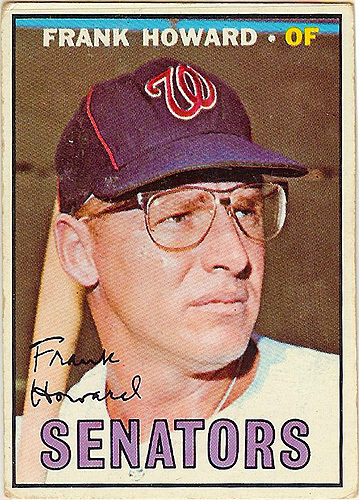 He stuck around in the majors until 2001, though, spending time between AAA and the majors with the Mets and the Astros. His final career line was .271/.341/.370 with 37 home runs and 97 stolen bases. Certainly not what was predicted for him, but I can’t hate on him for a career like that. Finally pulled this from a pack of Topps Update a week or so ago. Glad to get it off the damn needs list. First things first, having a big sale over at my Amazon webstore ( ). I’ve dropped prices on pretty much everything. I’m not crazy about peddling stuff on the blog, but I’m only doing this for Cyber Monday, so I figured one day of the year shouldn’t be too bad, right? And I think the prices really are pretty good. Didn’t exactly go crazy over the weekend when it came to baseball cards. The only thing I did was finalize the 1991 project, which only strengthened my resolve to avoid the 1992 Project. I used the biggest binders I could find for the 91 Project and it still flowed over into a second binder. It’s insane. I don’t even want to think about how much storage space would be required for a 92 project. So, alas, no more past 91. 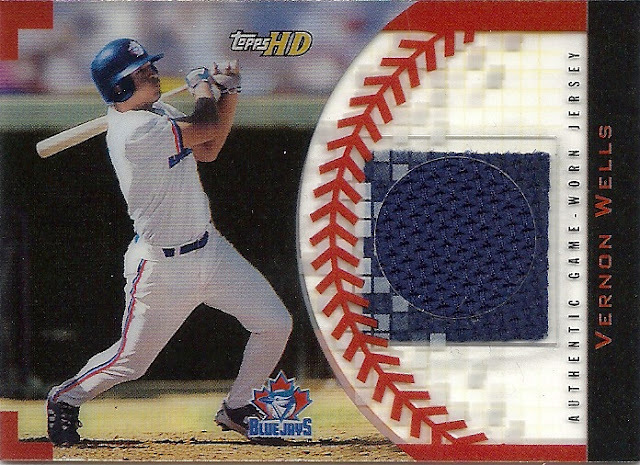 I got the Expos and Blue Jays on Nachos Grande’s ongoing group break, and managed to get a sweet hit, a Vernon Wells GU with a nice sweet swatch on it. Check it out, it’s a damned sweet card, though I will likely be dealing it away. Saw some crazy Black Friday deals on cards, but since we decided it was finally time to upgrade our TV, the money I made from my own crazy sales went right into that discounted TV. It was a fun weekend, but like I said, not so much focused on cards. I seem to have lost my verve for collecting at the moment, but I think it will eventually return. Probably a side-effect of the offseason. Let’s see what other folks said in the last week. Apologies if I miss some of my favorite posts, as there was just way too much for me to cover in one post. Flywheels opened a pack of 93 Stadium Club Series 2 over at a Pack to Be Named Later. Heartbreaking cards of staggering genius showed off some awesome cards of King Felix. Garvey Cey Russell Lopes examined the evolution of Dodgers closers. Emerald City Diamond Gems continued the Tops of the Topps series. Night Owl continued the Topps 60 series and opened the contest for the worst card of 2010. The Greatest 21 days featured Bernie Williams and Pete Coachman and showed off more of the Cooperstown haul. Smed talked about Chuck McElroy, Matt Capps, and Wilson Ramos (I was thankful for that trade, that’s for sure). 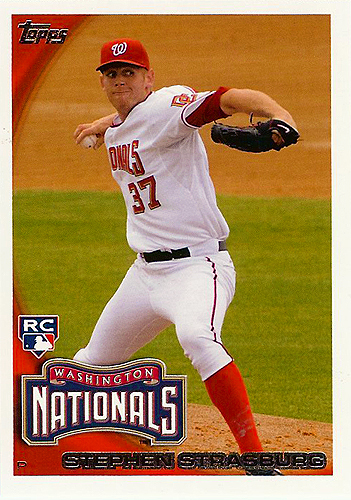 Baseball Cards Come to Life chatted with former Blue Jays prospect Nate Cromwell. 30-Year Old Cardboard scored a Vince Coleman 85 Fleer update. Nice! Mark’s Ephemera entered the Hot Russian Space Chicks phase of Packs Gone Wild. Awww yeah. The Great Sports Name Hall of Fame shared some great email from eBay saved searches. And that’s all I have for today. Have a great one! Man, are those some birth control glasses or what?